Dominik, a Taurus, was born and raised in the beautiful countryside of Southeast Austria. After watching a documentary about Shaolin monks in elementary school, he became fascinated by the power of spiritual practice. At an early age, Dominik began to explore and practice energy work. Through his practice and by studying plant medicines, reading inspirational books, and attending seminars with spiritual teachers in the West, he has learned that he is more than just the physical body. At the age of nineteen, Dominik left his career as an electronics technician and began traveling. 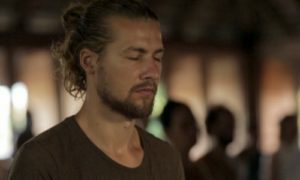 During his journey, he encountered Agama Yoga on the island of Koh Phangan, Thailand. For him, discovering the ancient wisdom of yoga and meditation for the first time felt like coming home. Shortly afterward, Dominik found Hridaya Yoga. In his first 10-Day Hridaya Silent Meditation Retreat, throughout the initiation into the Self-Enquiry Method of Ramana Maharshi he began realizing the indescribable peace within—understanding that this is where the answers to all his questions reside. Touched by the Hridaya teachings, he has spent over 200 days in silent meditation retreats and participated in the 2012 Hridaya Teacher Training Course. 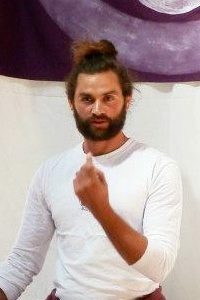 In addition to teaching yoga and meditation, Dominik has a master’s degree in landscaping and permaculture. He is the founder of Gartenhandwerk Gräf, a landscaping business in Austria where he and his team design and build landscapes and gardens. He also runs a business importing and selling dates. Dominik finds great joy in inspiring and assisting people to create a life they love.